So I’ve been busy- busier than my blogs and feeds show, since it’s been hard to find something that plays well with Facebook. HOPEFULLY THIS POST WILL GET POSTED ON FACEBOOK. I swear, if this plug-in doesn’t work I’m going to give up, as I like posting to Facebook, but I like doing so in a way where Facebook doesn’t get its lovely tentacles into every place I frequent. I do love to share, but I share different things on different places! For instance, my tumblr blog is more my spot for nerdiness. The last picture is a piece I did for a Final Fantasy collaboration wherein various artists chose a character from the Final Fantasy video game series. Considering that series spans over, uh, well over 15 games if you include the off-shoots, there’s a lot of characters to consider. Not bad for a series that’s been around since 1987! So. 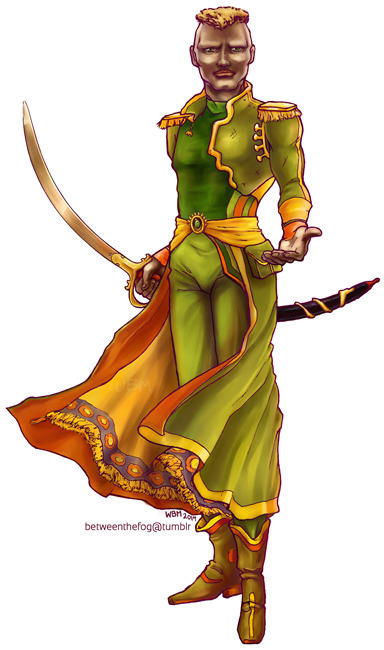 The character I chose was Leo Cristophe of Final Fantasy 6, one of my favorite games in the series. He’s not as major a character as some, but he symbolized the idea that the Empire (ie, the big bad) had some people inside it who could change it for the better. Of course, when he died, that sort of started the big long slide towards the second half of the game, where things hit rock bottom and the cast has to start from ground zero and work their way up. Leo’s also rather famous for being one of the characters that spawned various urban legends on how a player could attain place him back in their party.